One of the worlds great mountain walks requiring good stamina, a high level of physical fitness and previous mountaineering experience traversing steep ascents and descents. This is the classic high altitude glacial trek between Mont Blanc and the Matterhorn and although relatively short in length it is a serious proposition similar to Himalayan high altitude trekking. The route closely follows the original ski traverse of the Western Alps from Chamonix to Zermatt; crossing several alpine passes and over a dozen glaciers. It involves rock scrambling, snow slope climbing and the use of ropes, crampons and ice axes. Starting out from Chamonix we trek up to the Albert Premier Hut, the first of many alpine refuges we will be staying in during the trip. We then have an afternoon of instruction in glacial travel using ropes, ice axes and crampons - essential skills necessary for our traverse. After this we start out on the Haute Route, crossing glaciers and passes and staying overnight at high mountain refuges. On the way we take in the ascents of the Pigne d’Arolla (3796m) and the Tete Blanche (3429m), fairly easy alpine peaks which provide superb panoramas of the Matterhorn and the summits of the Swiss Mischabel chain. 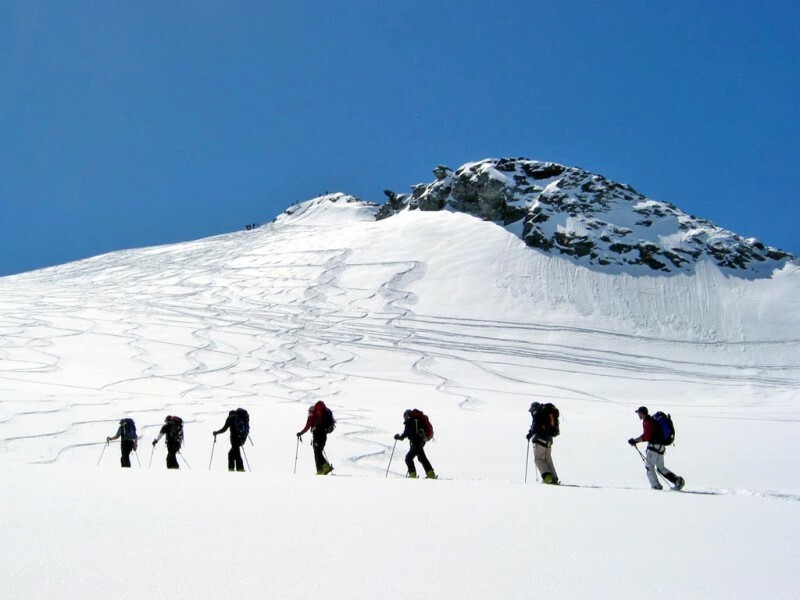 On this challenging walk you will receive expert guidance from our International Mountain Guide and have the opportunity to learn about essential mountaineering skills necessary for safe walking on glaciated terrain. This route covers a distance of 120km (75 miles) walking up to 8 hours per day with some extra long days and steep ascents on some of the sections. It provides dramatic scenery in the very heart of the European Alps. On the route you will stay at Alpine refuges, gites and occasional hotels and will need to carry your personal equipment throughout the trek. This trek is one of the world's finest and an excellent warm up for those with aspirations towards Himalayan high altitude trekking. Crossing into Switzerland via the Col Superior du Tour (10790ft) we have an optional ascent of the Tete Blanche (11220ft) subject to prevailing weather conditions and overnight stay at the Cabane d'Orny (9285ft). The day begins with a fairly easy descent on a good path into the Vallon d'Arpette de Saleina followed by a traverse along the eastern side of Val Ferret to La Fouly where we stay overnight in a comfortable hotel. We climb to the Col du Neve de la Rousse (9025ft) and adjacent Pointe des Planards (9400ft) for spectacular views of Mont Blanc and the Grand Combin followed by overnight stay in Bourg St. Pierre. After a long and easy ascent to the Col de Lane (9950ft), we descend via the old stone bergeries at Nicliri (8175ft) to our overnight stop at the Cabane Brunet (6900ft). Today offers excellent views of the Grand Combin as we make our way via the Col d'Avouillons (8690ft) to our overnight stop at the Pannassiere Hut. After our ascent to the Col des Otannes, we then descend the Pierre a Vire to Lac de Mauvoisin followed by a steep ascent to the Chanrion Hut (8075ft). Today includes 4 cols: the Col de Tsofeiret, Col de Lire Rose, Col de Mont Rouge and the Col de Cheilon, on the way to Cabane des Dix (9600ft). After an early start we reach Pigne d'Arolla (12450ft) - the highest point on the Haute Route before a short glacial descent to the beautifully located Vignettes Hut (10365ft). After climbing to the Col de L'Eveque (11105ft) we then descend onto the Haute Glacier d'Arolla before crossing the Col de Bertol (10720ft) to reach the Cabane de Bertol. We begin the day with an easy climb to the snow covered peak of Tete Blanche (12215ft) before descending via the Stockji Glacier to the Schonbiel Hut located immediately beneath the Matterhorn. After the rigours of a strenous and exhilarating trip we finish with a gentle walk down to Zermatt nestled beneath the majestic North Face of the Matterhorn where we lunch before making our way to our local hotel.